Actually Ervin was never involved with the CSRV [UCLA Center for the Study and Reduction of Violence] and had no part in its planning or development. Nevertheless, a radical students organization called Students for a Democratic Society (SDS) pounced on the "UCLA psychosurgery project" in wildly accusatory articles in the _Daily Bruin_ and the underground press. Politically activist students suddenly began to picket with signs denouncing "A Clockwork Orange at UCLA," "Stop Psychosurgery at UCLA," "Fire Frank Ervin," "Drive West into the Sea" and the like. At first the staff assumed that the sudden hostile attack on the yet unfunded center was essentially political. The theme seemed to be, "If Governor Reagan is for it, we are against it." However, a small group of much more sophisticated political radicals, including two or three psychiatrists, took over the fight against the establishment of the CSRV. They went to many community groups and organizations, ranging from the American Civil Liberties Union to the Black Panther Party, and persuaded them that the proposed center was in fact racist, sexist, and dangerous to human rights; in fact, nothing less than a government-sponsored program for mind control. Funding for the UCLA Violence Project had been approved by Ronald Reagan but was withdrawn in response to public protest. The Project was to have been housed at a used Nike missile site outside Los Angeles. Dr. West states in a footnote to his chapter on the Project, that Dr. Frank Ervin had recently been recruited to the Department of Psychiatry at UCLA. Another California project cancelled due to public protest was a proposal to implant brain electrodes in prisoners at Vacaville State Prison, site of CIA mind control experiments on the drug pemoline under MKSEARCH. The prisoners were to be monitored by remote tracking technology post-discharge. If they entered a restricted area or exhibited sexual arousal patterns on remote EEG telemetry, a signal would be sent to their brain electrodes immobilizing them, and law enforcement personnel would be dispatched to apprehend them. Dr. Louis Jolyon West was cleared at TOP SECRET for his work on MKULTRA. His numerous connections to the mind control network illustrate how the network was maintained; not through any central conspiracy, but by an interlocking network of academic relationships, grants, conferences, and military appointments. Some doctors in the network were not funded directly by the CIA or military, but their work was of direct relevance to mind control, non-lethal weapons development, creation of controlled dissociation and the building of Manchurian Candidates. Bluebird blows the whistle on extensive political abuse of psychiatry in North America in the second half of the 20th century. Many thousands of prisoners and mental patients were subjected to unethical mind control experiments by leading psychiatrists and medical schools. Organized academic psychiatry has never acknowledged this history. The network of mind control doctors involved in BLUEBIRD has done a great deal of harm to the field of psychiatry and to psychiatric patients. My goal is to break the ugly silence. The participation of psychiatrists and medical schools in mind control research was not a matter of a few scattered doctors pursuing questionable lines of investigation. Rather, the mind control experimentation was systematic, organized, and involved many leading psychiatrists and medical schools. The mind control experiments were interwoven with radiation experiments, and research on chemical and biological weapons. They were funded by the CIA, Army, Navy, Air Force, and by other agencies including the Public Health Service and the Scottish Rite Foundation. The psychiatrists, psychologists, neurosurgeons, and other contractors conducting the work were imbedded in a broad network of doctors. Much of the research was published in medical journals. 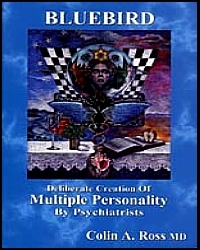 The climate was permissive, supportive, and approving of mind control experimentation... (Bluebird: Deliberate Creation of Multiple Personality by Psychiatrists By Colin A. Ross MD A 10-Page Summary). Colin A. Ross is a psychiatrist of Canadian origin and professional training. Ross attended medical school at the University of Alberta, Edmonton, Canada and completed his training in psychiatry at the University of Manitoba, Winnipeg, Canada. He moved to Dallas, Texas in the early 1990s where he took a position as Director of Dissociative Disorders at Charter Hospital of Dallas. Ross specializes in posttraumatic stress and dissociative disorders (e.g., dissociative identity disorder) and has written many books and research papers. Presently Ross works in the Ross Institute for Psychological Trauma, a hospital in the Dallas, Texas area. He also directs a trauma program at Forest View Psychiatric Hospital in Grand Rapids, Michigan. Most of the people the Ross Institute treats describe very traumatic and abusive childhoods. Dr. Ross has also produced several documentaries and educational films about dissociative identity disorder. In 1999, he teamed with producer James Myer in the making of Personality: Reality and Illusion. The docu-drama featured Chris Costner-Sizemore, the first woman thought to be diagnosed with MPD. Ms. Sizemore's life was portrayed by Joanne Woodward in the Fox motion picture, The Three Faces of Eve. In the past Ross was contractor of psycho-pharmaceutical companies; he has been called to participate in neuroleptic trials and continues to publish in the American Journal of Psychiatry (Wikipedia).